Life Arts teams up with the Redbird Rookies — LIFE Arts Inc.
Life Arts teamed up with the Redbird Rookies organization to put on an amazing three-day concert from June 26-28th where they invited hundreds of local St. Louis area children to The Sheldon Concert Hall. The show began with Brian Owens and his band The Deacons Of Soul. 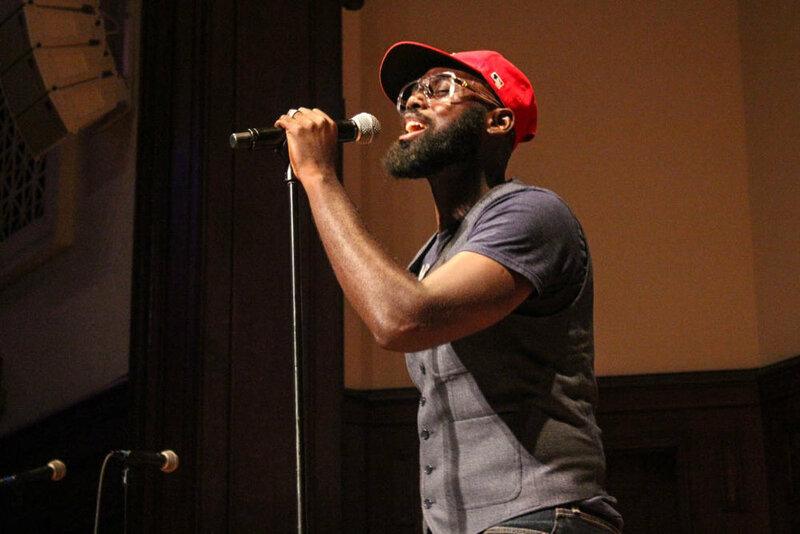 The Marvin Gaye experience was in full effect as they performed hits from the late artist. Owens sang renditions of classics such as "I Heard it Through The Grapevine" and was joined by Malena Smith for a duet of "Ain't No Mountain High Enough." Earlier this summer the Compositions for Life students were able to meet Cardinals Hall of Famer Bob Gibson. This was after they'd been commissioned by the St. Louis Cardinals to write a song for him that would play during the entire 2018 baseball season. The students created "Complete Gamer", a song about Gibson and his rise to glory. During this meeting Gibson mentioned that he enjoyed various styles of music. Afterwards the group took on the challenge of creating six more songs dedicated to highlighting his life, in different styles of music thus creating the Bob Gibson Suite. All of these songs were written, recorded and mastered by The Score. They were each written in the three weeks between having initially met Bob Gibson and the concert. The first song titled "Glory" was performed by Thomas Mack, Daniel Long and Christopher Daniel. “We tell em' Glory” this is the chorus that the audience began to sing along with. "You can make it like Gibson get you head out of the trenches" was an inspiring verse from Daniel Long. Thomas Mack took over as hype man encouraging the crowd to clap and sing along in-between his verses. Glory was followed by the song titled "YMCA" . The verse rapped by Daniel Long says, "We talk about Gibson one of the greats but not Josh that took his father's place." This powerful verse refers to Gibson's older brother Josh, who as an important figure in his life and the lives of other young blacks growing up in Omaha. Gibson often referred to him as a father figure. Justice Mack & Kalcia Saxton took to the mic to preform "1968." "1968 was a very hard time in this place racism depression and hard days," are the lyrics they sung. The song is almost sung in acapella as their voices were only accompanied by light keys and strings in the background. The lyrics highlight the struggles of poverty and racism during the time period and place where Gibson grew up. Paco Lee then uses his guitar, and the stage dims. A spotlight shines down on him as he performs "Living in The Ghetto" alongside Christopher Daniel. "Living in the ghetto they tried to keep me low, used against myself to boost their ego." The Bob Gibson Suite is certainly a beautiful ode to Gibson. A series of songs that details his life from Ghetto to Glory. With tempos that range from upbeat to sweet melodies. "We came up with the beats and put our own feelings and emotions into each song.” says Kilicia Saxton. “We just chose from major events in his life and started making lyrics,” says Christopher Daniel. There was a surprise appearance by the St Louis Cardinals Mascot Redbird. Prompting the crowd to sing a baseball classic "Take Me Out to The Ball Game." To finish off the night "Complete Gamer" was preformed alongside the City of Music All-Star Chorus. 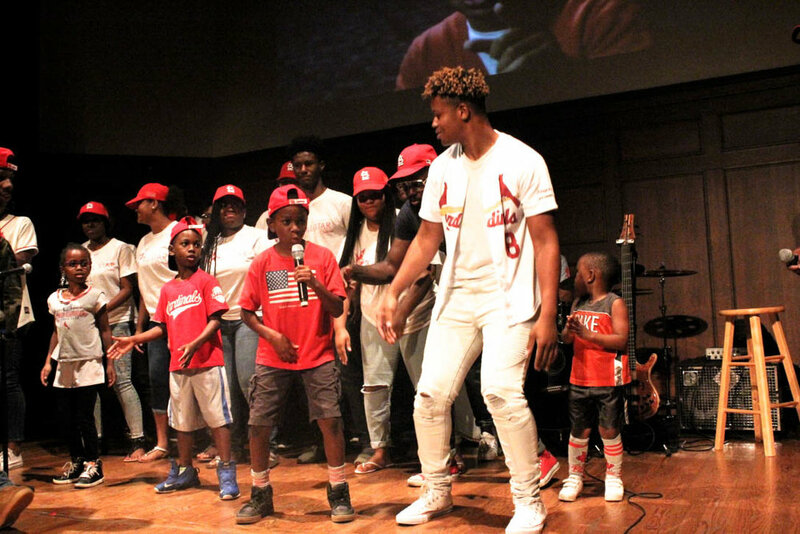 The night was able to introduce a new generation of Red Bird Rookies, their parents , grandparents and mentors to the story and legacy of Bob Gibson through song.